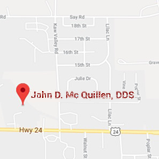 Dr. John McQuillen and his team work to provide the people of Wamego, KS and nearby communities with excellent, modern dental care. Ours is a small-town practice based on the values of trust and comfort for all of our patients. We treat you and your family the way we would want to be treated, from the friendly greeting when you walk in the door, to gentle treatment in the clinic and an eagerness to educate you about your care process. Call today to schedule your appointment with Dr. McQuillen. Our team is happy to help you find a time that is convenient for you and answer any questions you may have about our practice or services.